Like this one - Arthur getting into corporate hospitality summed up the era! I totally agree. Whenever I watch this one it reminds me so much of the period, which was still a time when people made an effort to dress smartly, particularly when they hit the town. I like the night filming which gives it a real vibe. It is reminiscent of the night filming in 'The Dessert Song' and 'Minder On The Orient Express' for me - when they're in a smoky bar or club you can almost feel like you're there with them. It has a really nasty villain in the form of actor Derrick Branche (Kenton) and an ice cold seductive femme fatale in the form of Natascha Taylor (Vanessa) - she became known as Natascha McElhone not long after being in this. Ray has a choice in this: the sweet honest Marian (Samantha Janus) or hot seductive super-b*tch Vanessa (Natascha Taylor) and is clearly bowled over by the bitter sweet venomous charms of the latter. Ray can 'clearly resist everything except temptation' and this is a mistake we all know he is making. As Ray suffers the kicking of his life in this, poor old Arthur is helpless. This is one point in the series where you can really see Arthur totally cares about Ray deep down and likewise just what Ray is willing to suffer for his uncle Arthur. When I first saw this fight scene I was genuinely a bit shocked to see it particularly as Ray is supposed to be the hero of the piece. This episode is a superb effort throughout and on a par with any decent Terry episodes I think. I really think Terry would have struggled against Kenton's dirty tricks in a punch up too to be honest. The characters in this are some very nasty corrupt types, Arthur is dressing up his corporate hospitality for something it clearly isn't, top night filming, tasty looking females, a scam, a fight scene and it's a very plausible plot throughout - the perfect Minder formula. Just like Ray, I must confess ... even though you know she's poison, how much do I fancy Natascha Taylor in this one? I seem to remember a fair bit of night filming in the later Ray episodes which gave the series a slightly noirish feel. The Natasha McElhone character has a touch of the noirish femme fatale about her too. This is a really good episode, funny and dark at the same time - very much in the vein of the earliest Minders but also bang up to date (when it was made). Derrick Branche deserves a mention in dispatches for his perfomance as the barking mad Kenton. Who'd have thought this was the same actor who played Gupta in Only When I Laugh? The man's a chameleon! I agree, it's been a while since I watched this one (well, about two years, but don't judge as I was born the same year the series ended), and there's something still true about this episode today: we still have ticket touts in London, selling everything from tickets to the 2012 Olympic events (I remember there was a large furor over that) to West End shows, as the ticket tout in this episode did. I liked Samantha Janus' character (was she doing Game On at this point? ), although it did feel like she was filling a gap left behind by Emma Cunningham's character, Gloria. Also liked the toss-up between Samantha's character and Natascha's character. Any idea on the interior site for the jazz club scene? Not sure exactly but the evening taxi scene is in Soho, postcode W1D 6DY. Ronnie Scott's Club is at 47 Frith St which is W1D 4HT - essentially around the corner (excuse the Minder pun). Wherever it is you'd have to bet it was somewhere nearby. It is on the list of those for further investigation. Cheers jno I don't think it's Ronnie Scott's but there were and still are a few clubs like that around there, keep up the fantastic work mate! There are some posters on the wall in the episode for the "52 Jazz Club". Real or prop? I can't find that club yet but there is a club called "Gerry's Club" at 52 Dean Street (coincidental number?) that I know a lot of actors use discretely. This club already has a mention on minder.org somewhere. There is a "Georgie Fame" poster on the wall and he was resident at the (Pink) Flamingo Jazz Club for a while, this was at 33-37 Wardour Street but closed in 1967 (this is now O'Neills pub which is about two doors away from the final shot of the alley way) - not the place but still evidence that this is the area perhaps. I have no idea if this is the place but the search shall continue - I'm working on it. I am currently looking into it in a bit more depth to try and get some a second opinion. Why? It is hard to match up shots from the episode with any pics of the place that are on-line. "We are standing not 20 yards away from a geezer who takes punters for 20 quid meals at 7 ton a throw. Could you imagine 5 bookings a week you know what that comes to?" "3500?" "It was a rhetorical question." After the previous two episodes I watched of this series, I felt a bit underwhelmed by this one. Had some good scenes in it, but just didn't click for me. I'm surprised that you didn't enjoy this one. One of my favourites from series 10. I have to agree with swainy here - this is one of my favourites from series 10 - a whole lot going on, nice ladies, nice punch-up and Arthur on a scam. Perfect Minder. Two EastEnders actors in this episode. Jake Wood and Samantha Womack. How many EastEnders actors have been in Minder? A top episode as others have noted. I appreciated the way the tone of the episode shifts over the course of fifty minutes. It gets darker than normal near the end and it works. Ray are Arthur are mixed up with a whack job and a mega-b*tch! The scene where Arthur does the deal with the ticket tout whilst touting himself is comic gold! 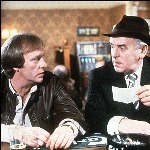 I totally agree, a truly great scene played so well by George Cole. I love Arthur's ideas for his hospitality business. Also at the end when he says he is ending the business saying he wants to spend the evening with a VAT. I was dragged along to the pantomime this Christmas in the New Theatre in Cardiff and saw Samantha Janus (now Samamtha Womack) singing live for real as part of the show. Wow, fair play, say what you want about her being in 'Eastenders', she is an absolutely fantastic singer. Walked past business centre in Islington that was used for some external shots the other day and its barely changed. She did represent Britain in Eurovision in the early 90’s. I remember being in Sainsbury’s in Cardiff Bay and could hear a voice I recognised, but couldn’t quite place it. Turned around and there she was! She was performing in South Pacific at the Wales Millennium Centre. This was around 2011/2012, she had just left Eastenders after the controversial baby swap storyline. What’s the old saying that the old saying that there is always someone stronger and nastier than you? Ray could handle himself, but he wasn’t Superman. Even Terry had a couple of pastings! Gary Webster had a recurring role as Graham Clark pre-Minder, brother of the more prominent character Barry Clark. There is a scene that is on YouTube where Graham stands up to the infamous Dirty Den. Maybe that is where the Minder producers got the idea to cast him. Just remembered a couple more, John Bardon, Jamie Foreman, Linal Haft (who appeared in Terry, Ray and Shane Richie eras). Oh of course the Daz doorstep guy!